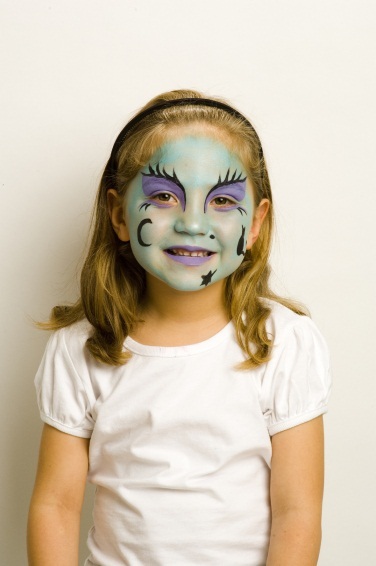 Use the brush and the white face paint from Snazaroo’s Halloween Face Painting Kit to carefully outline the ghost shape, then fill in the outline while avoiding the lips and eyes. Take the green face paint from Snazaroo’s Halloween Face Painting Kit and use the tip of the brush to paint two eyes in the ghost’s head. 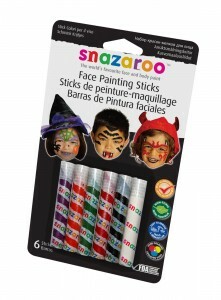 Use the brush to outline the body and eyes with the black face paint from Snazaroo’s Halloween Face Painting Kit. 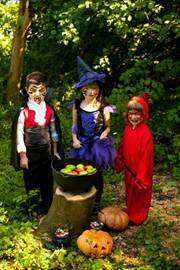 Add eyebrows, pupils, a nose and a mouth and your little ghoul is ready to trick and treat! Using a WHITE face painting stick, draw fangs from each corner of the mouth. Then with a RED face painting stick, add some drips of blood from each fang, carefully paint the lips, and a add a line at the outer corner of each eye. Using a BLACK face painting stick, draw exaggerated eyebrows and draw an upturned triangle at the hairline. Carefully outline each fang. Using a damp sponge, apply a layer of Turqouise or Green paint all over the face as a base. With a brush, paint Lilac or Purple over the entire eyelid and eyebrow finishing in a point at the temple. Apply the same colour in a line under the eye sweeping down to a point at the top of the cheekbone. Paint the lips in the same shade. Using Black paint, create thick, bushy eyebrows by painting thick lines along the upper edge of the lilac shape around the eyes. Get creative by adding a moon, stars, a beauty spot, and even a cat, to complete the effect. 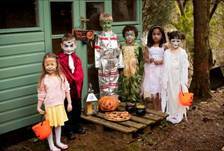 London Mums used Snazaroo, a brand which has taken the fear out of face painting… ah ah… with some terrific products to allow mum and dad to get their little ones ‘trick or treat ready’ with ease. They are non-toxic, hypoallergenic and easy to remove with soap and water and offer complete peace of mind for us mums. 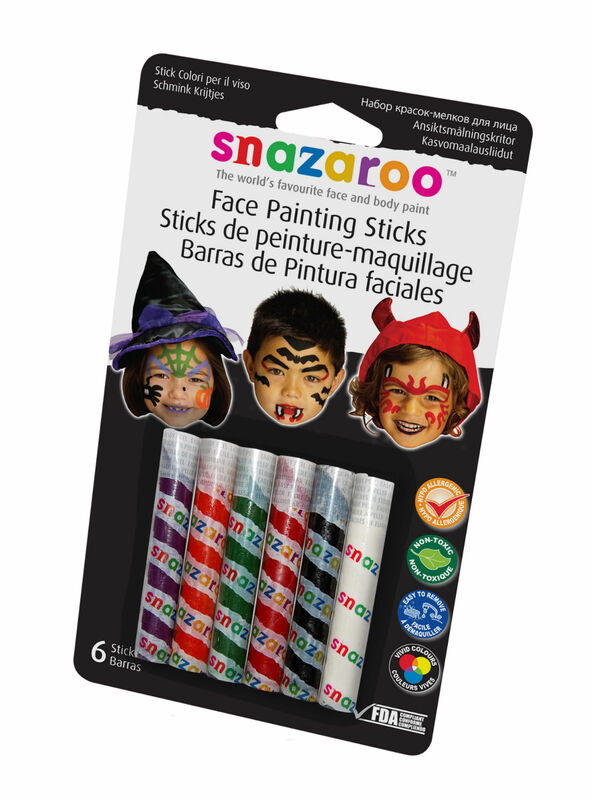 Snazaroo Halloween Face Painting Sticks are priced at £4.99 per kit. 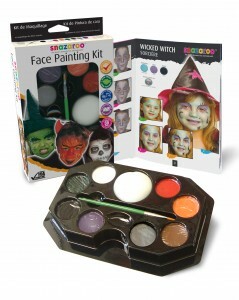 Snazaroo’s Halloween Face Painting Kit are priced at £11.49, easy-to-use and include a choice of eight colours, a brush, a sponge and an inspirational step by step guide to help fire your imagination. With enough paint to create 50 faces, it’s also a great option for Halloween parties. For more information, including simple step by step guides, advice and the nearest stockist, visit www.snazarooo.com. This entry was posted on Wednesday, October 5th, 2011 at 11:19 pm and is filed under Blog, Get Creative, Tested & Recommended. You can follow any responses to this entry through the RSS 2.0 feed. You can leave a response, or trackback from your own site.